Your Cat Magazine June issue featured an excellent article on cat enclosures so I am going to highlight the best here: Click on the title of the companies or the photo’s to be taken to their web site. ProtectaPet is a garden cat proof service dedicated to keeping your cat in your garden. Using cat proof fencing, cat enclosures, cat runs and cat pens, they can work with you to provide you with an effective solution to your individual needs. Their designs are manufactured in the UK for quality assurance and registered with the Intellectual Property Office. ProtectaPet has expanded its cat containment range in Britain. For clients living in flats, they also do cat balcony enclosures. “It is commonly accepted that cats have the right to roam freely. However, free-roaming cats have a life expectancy of two years, as opposed to the otherwise expected longevity of 15 years. This is due to exposure to dangers such as increasingly busier roads, fighting with other cats in the neighbourhood, consumption of pest control, such as slug pellets, amongst many other risks. In New Zealand and Australia, cat owners are obliged to microchip their cats and keep tabs on their whereabouts. But Britain is leading the way in cat containment solutions. British company, ProtectaPet, have patented technologies which contain even the most agile breeds of cats like bengals and orientals. Their products enable cats to come and go from their house and garden freely, enjoying the optimal quality of life, while owners have peace of mind and assurance of their safety. ProtectaPet® have been retailing and installing fencetop barriers since July 2012 and have just launched a modular cat enclosure kit. This is available to purchase for DIY enthusiasts in the online shop or customers have the choice to have it professionally fitted by the ProtectaPet installation team, who travel the length and breadth of the UK. The company hopes that the latest freestanding product will increase accessibility to cat owners who have privet hedges and large gardens. The enclosure is modular so it can be constructed to the client’s individual requirements, allowing for the addition of single or double gates, brackets or a mesh roof. It features patented CruciLock™ ground spikes with self-locking push fit design which provides a secure base on soft ground such as turf. Alternatively, the client can choose CruciLock™ bolt down plates for hard ground such as patios. The enclosure can be made as large or as small as required: from small ‘catios’ through to large gardens and fields. As well as animal welfare, high quality British design and manufacture is at the heart of the company’s ethos and the cat enclosure components are made from pre-galvanised and powder-coated steel for endurance against the elements. The cat enclosure includes a welded steel mesh chew guard, protecting it from wildlife damage and prolonging the life span of the product to make it a worthwhile investment for savvy shoppers for years to come. Looking to the future, this new line of British designed and manufactured enclosure products will be suitable for the containment of other pets such as dogs and chickens, as well as cats. The business promises to be a great good news story for British innovation and manufacturing, but best of all, for the welfare of cats internationally. Photo’s below show ProtectaPet at work! The Outdoor Cat Run is the perfect solution. Larger than many other outdoor cat pens available, this will give your cats the freedom to enjoy the great outdoors safely and securely. Perfect for owners of pedigree, indoor or poorly pussycats, this walk in cat enclosure has many fantastic features and it will blend into your garden beautifully. Outdoor cat houses are a great way to keep your cat safe and warm. 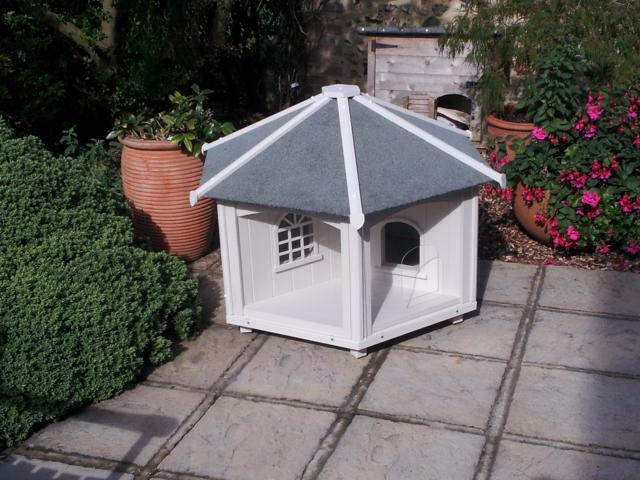 The cat houses also look great in the garden and are easy to clean and maintain. Cat houses are used by pedigrees to moggies and even feral cats. What could be better than their own personal cat house, customised to suit your cats and your needs. These designs are perfect, keeping your cat comfortable and cosy protecting against all weather conditions. The windows allow nosy cats to see whats going on outside without being hit by the elements and also let in light, they also look great in the garden. All my Cat houses are unique and handmade and crafted. Strong, durable and weather resistant. All wood is treated or painted and they tend to use ashfelt as their main roofing material. They are still building their range at the moment, so more designs will follow, so keep your eyes peeled. All pet homes can be made to your own design and specifications Beach style Cat House range The most popular design made so many of this style cat house, the main colour is cream and green but other colours can be arranged. Katzecure was founded by Andrew Farmer at the beginning of 2004 to fill a gap in the market for a practical, yet elegant solution to safely contain cats within garden perimeters. They turn your garden into safe havens that keep your cats secure in your garden. From their base in Sussex, they manufacture thier brackets locally using skilled craftsmen and source the wood from British Forestry Commission managed woodlands. They have hundreds of cat proof installations across the country, stretching from Cornwall, North Wales and Scotland. They regularly travel the whole country to conduct free surveys and carry out installations. Penthouse Products has been designing, manufacturing and supplying cat cages to breeders, catteries, rescue centres, vets and domestic cat owners for 20 years. Their cat cages offer safe, comfortable, hygienic accommodation and they pride themselves on an enviable reputation throughout the UK, Europe, USA and even Australia for excellent service and superior product design. So, there you have it. Some excellent designs to keep both you and your cat happy. I hope you enjoyed this outdoor cat enclosure article.